Everyone loves a good comfort food recipe. 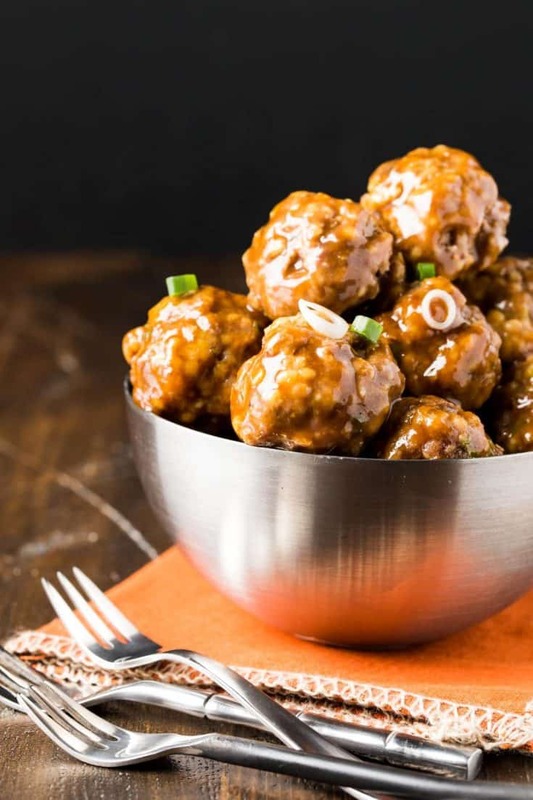 These delicious Saucy Asian Meatballs can be made ahead of time – perfect for entertaining! Meatballs are such a comfort food, yet I hardly ever make my own. Why? I’m lucky enough to have an amazing Italian deli not far from my house that does them right. But meatballs are so versatile and so universally liked, why stop at the Italian variety? That’s one of the reasons I love this recipe for Saucy Asian Meatballs from Gimme Some Oven. 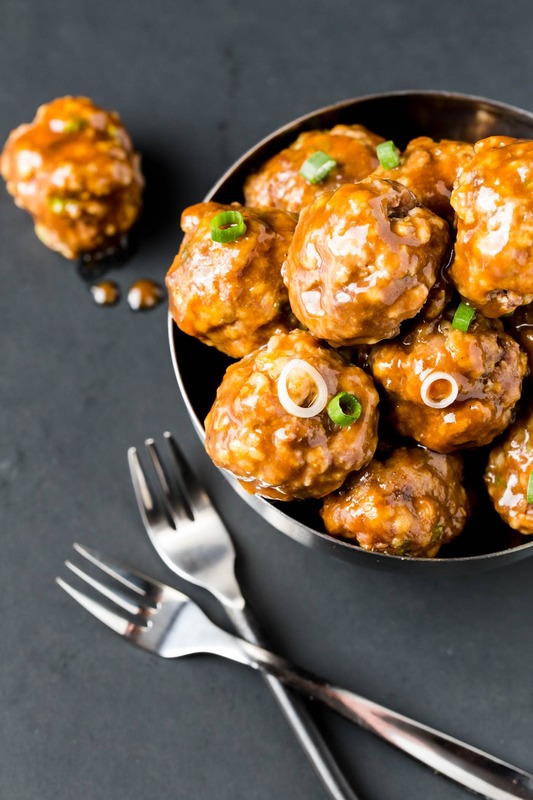 It’s traditional comfort food – meatballs – spiced up with Asian flavors and taken off the typical pile of noodles and used as an appetizer. The combination of ground pork and ground beef gives the meatballs depth and keeps them tender. This is an easy make-ahead appetizer for any gathering. Simply bake the meatballs and store them in the fridge (or even the freezer!) until you are ready to serve them. Gently rewarm them in either the oven or microwave and toss them with the warmed sauce. Voila! You have a hot, hearty appetizer to share with friends and family. People might think you spent all day in the kitchen slaving over homemade meatballs. Let them think that. Your secret is safe with me. Tip: Use a small cookie scoop to make quick work of portioning out the meatballs. The NorPro brand is my favorite. Combine all meatball ingredients in a large bowl. Shape into 1-inch balls. Place on baking sheet and bake for 11-14 minutes. Meatballs are done when no longer pink inside. Stir together all sauce ingredients in a bowl. Pour over warm meatballs and gently stir until evenly coated. Thanks! It’s a fun twist of your regular cocktail meatball. Thanks, Marla. I hope you have a chance to try them out! Anna, I don’t even know whether I spotted these first on your blog or Ali’s (found my way to both via Pinterest), but I made these for lunch today and they were lovely. Thank you for sharing!! Hi Pille, So glad to hear you liked them. We appreciate the feedback! You can definitely make them without pork. Enjoy! These look so moist and delicious!! Would be great with some rice and sriracha! Made these tonight with all pork, and no breadcrumbs. Served with stir-fried broccoli and red peppers. Delicious! These look delicious! I make similar meatballs with ground chicken and they are a favorite! Ground chicken sounds like a great alternative. Will have to give that a try! My family is coming for christmas and how many to you serve? Hi Erin, I usually serve these as appetizers and count on 3-4 per person since I always have other snacks, too. Happy Holidays! These look delicious. I am sure we will make these. Thanks for commenting, Regina. I hope you enjoy them! Can’t do the beef but will definitely sub with ground turkey. Recipe looks awesome! I’m sure ground turkey will be a great substitute. Thanks for stopping by, Barbara! I made them today…they were amazing…thank you!! I am making these today but would like to know if Quinoa is an acceptable substitute for the panko. I have leftover prepared quinoa in my frige. Hi Antonette, good question. I’ve never used anything but panko in these meatballs as it helps to lighten up the meat mixture. The quinoa may work just fine, but my only concern is it might make the meatballs a bit dense. Give it a go and let me know how it turns out! Do you use fresh minced garlic or dried? Hi Brenda, I use fresh. Enjoy! I made these for Christmas Eve and they were delicious. Nice switch from the barbecue style meatballs. So glad you liked them, Margaret! Hope you and your family enjoyed a wonderful holiday!